Average Weight	: 6 - 15 lbs. The Italian Greyhound is an ancient breed. A discovery of a 6000-year-old Egyptian tomb shows dogs similar to the Italian Greyhound. They are also represented in decorative Mediterranean art dating back 2000 plus years ago. 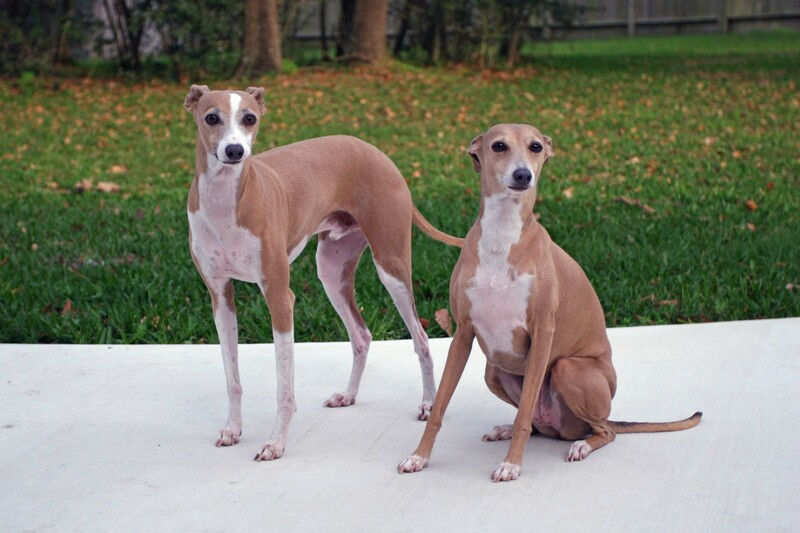 Italian Greyhounds became popular amongst Noblemen during the Renaissance era. Another discovery uncovered a small Greyhound type dog in an ancient lava flow in the city of Pompeii in the Italian region of Campania. In the sixteenth century, like the Greyhound, this breed was brought to Europe by the Phoenician civilization, and became popular among European nobility. James I of England, Catherine the Great of Russia, Anne of Denmark and Queen Victoria, all owned Italian Greyhounds. During the 1700's Frederick the Great of Prussia took one of these little dogs to war with him, and he buried the dog himself when it died at the Sans Souci Palace. It was Frederick's dying wish that he be buried next to his dog, so on the 205th anniversary of his death, on 17 August 1991, Frederick's family transferred his remains to Sans Souci, and placed them beside his little Italian Greyhound. In the 19th century an African chieftain liked the dogs so much that he offered 200 cattle in exchange for a single Italian Greyhound. Although the breed's original purpose has been lost to history, the Italian Greyhound may have served as a hunter of small game in addition to his duties as a companion. By the Middle Ages, the breed had made its way to southern Europe and was very popular among the aristocracy, especially in Italy — hence its name. Many Italian Greyhounds were immortalized, along with their owners, in portraits by famous artists such as Pisanello and Giotto di Bondone. In the 1600's the Italian Greyhound arrived in England, where, as in Italy, it found many fans among the nobility. Royal owners throughout the centuries include Mary, Queen of Scots, Princess Anne of Denmark, Charles I, Frederick the Great of Prussia, and Queen Victoria, during whose reign the breed's popularity peaked. During World Wars I and II, when dog breeding became an unaffordable luxury for most people, the numbers of Italian Greyhounds in England dwindled dangerously low. Each time the wars ended, British breeders used those American-bred Italian Greyhounds to restore the breed in Europe. Today the Italian Greyhound is enjoying a resurgence in popularity, as dog owners discover this elegant little hound who dates back partnering with Man more than 2,000 years ago. Although the small dogs are mainly companionship dogs they have in fact been used for hunting rats or mice. •	Smallest of the family of Gazehounds [dogs that hunt by sight]. Needy: need lots of love and attention or they become shy or hyper. •	Affectionate, love to snuggle and stay close to their owners all the time. •	Sensitive, alert, smart, and playful. •	Shy, reserved with strangers. •	If treated harshly Italian Greyhounds can become fearful or snappy. •	Clever, but short attention spans: keep training short and sweet. Need motivational methods when training ~ otherwise will have a "what's in it for me?" attitude toward training. •	OK with children, but children must remember they are a delicate breed, no rough housing. •	Italian Greyhounds usually get along well with other pets. •	Hunters by nature they will chase moving objects & small animals. Keep leashed. •	Puppies often break bones, as this breed is fragile and rambunctious. •	Known to be difficult to house train. The Italian Greyhound is naturally gentle and submissive by nature, but also very affectionate. They are reserved and will listen to their masters; they rarely exhibit destructive behavior except when they are bored, abused, or distressed. Playful and intelligent, these dogs make wonderful companions for families. They can be particularly observant, vigilant, and perceptive. They are not difficult to train and are best trained at an early age. It is important to not be too firm with these dogs since they tend to take directions and tone very seriously. Learning how to overcome their shy and timid nature will help provide the proper handling. The Italian Greyhound can also be very high strung and timid; they do need to be handled gently and are well suited for a household that does not have lively children or pets with a lot of energy. These dogs will sense the owner's state of mind and personality fairly easily; they will adapt best to calm and natural settings, and they may even need reassurance by stroking during a stressful situation. They are naturally independent but also are dependent on their owners and caretakers for peace. These dogs tend to become snappish if they are frightened, anxious, or disconcerted. They may be difficult to housebreak since they can become so anxious easily. The Italian Greyhound is a natural runner and will run at very high speeds when needed. They are highly active, and can climb wire fencing, jump from tabletops, and even jump over small walls in the backyard. They do not do well with larger dogs as they can become very protective and hurt themselves very easily. In general, these dogs are not easy to get along with; although they may show affection to their owners and become companions easily, they do have moments where their patience is tested and can become quite self-centered. These dogs do, however, get along with other Italian Greyhounds and will do well as a pair in the family. The dogs are fine breed but can be fairly destructive if they are not well trained. Sleek and short, they can get into a lot of trouble with ease! They have a natural propensity for gentleness and do well with children and even infants. However, they are also quickly agitated and may overreact if they are in a stressful situation. Still, these dogs are reasonably good watch dogs and will bark at unfamiliar sounds. They do nto get along with cats or other small dogs and may even scare other animals away with their harsh bark. They are very reliable and will rarely run far from home. A natural gazehound, these dogs instinctively hunt by sight and they also exhibit characteristics of being strong with a prey drive. It can be difficult to housebreak these dogs since they have small bladders; however, with the appropriate amount of attention, patience, and consistency the smallest challenges can be overcome. Anesthetics: Since The Italian Greyhound has such low body fat they may be more sensitive to barbiturate-based Anesthetics. Since the Italian Greyhound has such a short coat and silky coat, it is very easy to maintain their luster and shine. The Italian Greyhound is one of the easiest dogs to take care of and groom, and will only need to be bathed when it has been playing in dirt. To keep the coat silky and clean, all that is needed is a piece of toweling rubbed against their skin. Since the Italian Greyhound is a natural runner with plenty of energy, they will need to be outside at least once per day. These dogs thoroughly enjoy jogging and running with their owners, and will make good companions for short distances. However, they are much better walking companions; they do need to be supervised when playing with other dogs since they can get injured very easily. They need to prevent accidents from occurring by staying protected whenever possible. These dogs also fare well with playing "fetch" and finding hidden items. They do enjoy hunting by nature, and can look forward to a game of hide and seek with owners. They are intense and have a strong stamina, but they will not play well in cold weather unless they are kept warm and well protected. These dogs are intelligent and will learn new skills fairly easily. Taking them to the park or dog playground will provide them with enough stimulation to keep them happy, motivated, and healthy. The Italian Greyhound is a very quick learner and trains well during its puppy stages. A puppy that is left without support or security will have temperament problems and will have constant fears to manage during later years. Puppies left without their mothers or siblings for extended periods of time will have difficulty socializing, and need this attention during their formative years to become better socialized in the long term. They may exhibit behaviors such as hand biting, nipping, and excessive barking; however, with the appropriate amount of training, these behaviors can be overcome. Housetraining is much easier during the period of 10-12 weeks; they cannot be expected to have control over their body functions until they are at least 10 weeks old, and waiting until they are too old can be a problem. Italian Greyhounds are extremely bright and paper training or litter box training will be the ideal choice. They are not good all weather dogs and making sure training takes place indoors will be your best option. These dogs require attention and positive motivation. They may need frequent stroking or caressing if they are uneasy, and they do well with crate training during the housebreaking stages. It's important to keep a firm grip on these puppies but also keep a gentle hand. Holding the puppies by wrapping them tight can help them stay safe and secure, and setting them on the floor requires that they have all four feet on the floor before letting go. The dog needs to be trained on how and when to climb furniture, and they should not be left unsupervised on a bed or couch whenever possible. It's important not to let the dog go unleashed in an unsecured area; they may have selective deafness where no amount of calling will let you be heard. These dogs need to be monitored on a regular basis as they can be easily distracted. Still, the dogs travel extremely well but do need to be crated for long car rides. They do have a tendency to leap out of cars or vehicles if they are not properly restrained. These dogs take direction and instruction well, and will be especially obedient after only a short period of time.